Sometimes without your knowledge, the Universe plays the cards to make you do what you love when you yourself are unaware of that fact. 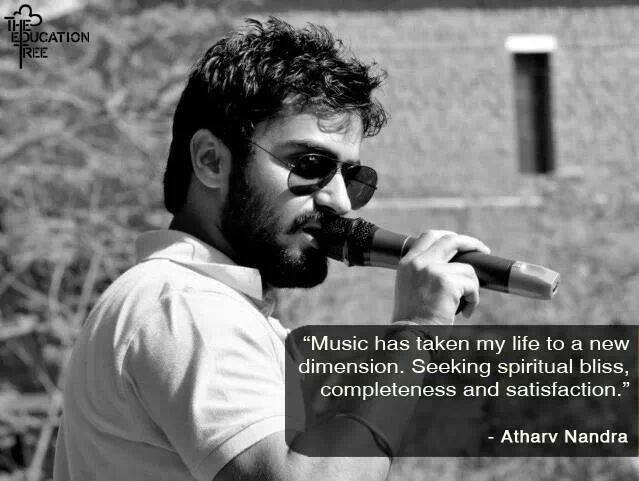 Something similar happened with Atharv Nandra, who now is a renowned musician. “I was 6th grade when I had to forcefully join Tabla classes. It was during then I learnt more about beats and music and developed interest. In 8th grade, I started learning guitar and by 11th grade formed a band and became back vocalist. I was awarded as ‘Best Vocalist’ in school and I realised that music has changed my life forever. When I entered college, I refused to become the lead vocalist of college band but couldn’t refuse it in the 4th time! After my first performance in 2011, my life had completely changed. I used to manage music with college hours (engineering) by practicing till late night 12-1am, daily. I did approximately 200 gig pans from orphanages to jail and Punjab to Goa. In 2014, i left the band and started a new & a bigger project with TATVA K and since then I have been writing,composing,singing every track & we have been releasing them with their videos and recently did a TVC as an actor for a corporate company called FLIGHT SHOP. We guys have crossed 3 lac views on youtube on one of our tracks which features JUGGY D ( U.K sensation).. In September, we are doing a 5 city tour with TATVA K & JUGGYD..
For the past 1 year, i have been working everyday & haven’t taken any holiday.. I am working approximately 18-20 hours everyday & sleeping for just 4 hours. we work 7 days a week and have no public holidays n bank holidays.. There is no one in my family from the field of music and everyone initially never supported us.Had to fight a lot of criticism and it took a lot of time to convince my family members and other people..